Sometimes, in the peak of summer heat, I have to hang up my canning apron. Even with the local produce overflowing, a gal can only stand so much heat. Too bad it’s not advisable to fire up the canner in a bikini. Luckily, pickle recipes that don’t require canning are plentiful. There are fridge pickles, freezer pickles and fermented pickles. While you’ll never be able to store these pickles at room temperature, chances are you’ll devour them before you need that fridge space back. Let’s take a step back and look at the world of pickling, why don’t we? In the oldest sense of the word, pickling is done with just vegetables and salt. The magic of fermentation uses salt to control for specific bacteria and yeasts that will transform sugars (from ripe fruits and veggies) into acids—like lactic acid—that further control for harmful bacteria. Back in the day (and still in plenty of kitchens around the world), there was a fermentation crock or two that continuously had pickles pulled out and new veggies piled in, for a never-ending supply of pickles. Sounds lovely, huh? I usually stick to fermenting cucumber pickles, sauerkraut and kimchi in my kitchen—I pack a couple of crocks full when the cabbage and cukes are abundant, let the bacteria do their work, and when things taste right to me, I store them away in my fridge. The fridge slows down the fermentation process, but keeps those beneficial bugs alive for doing good work in our bellies. Fermenting pickles isn't tough and doesn't require much equipment. You probably already have all the equipment you need! Mason jar? Check. Gallon zip-top bag? Check. Access to lots of amazing locally grown pickling cucumbers? But, of course. The simplest set-up is to wash and pack a few whole or sliced pickling cukes into a very clean quart sized mason/canning jar, leaving a good couple inches at the top. Be sure to toss in some dill, fresh or dried, a spoonful of pickling spice blend and maybe even a dried red chile. For extra crispy pickles, cut a little off the blossom end (that’s the yellowish end, opposite the stem). Then you can add brine (a.k.a. salt water) at a ratio of 1.5 tablespoons of sea salt per quart of water until the cucumbers are submerged. Chances are those little guys will float to the top. That’s okay! Next you’ll make a little weight to hold them down. Fill a large sealable food grade plastic bag with 1 quart of water and 1.5 tablespoons of sea salt. Press out the air and seal the bag. Then push the bag into the mason jar, letting the bag fill all of the space left in the jar (you can get rid of any excess brine from the baggie if you’d like). Sometimes you get a little overflow action at this point in the set-up, but you can handle it with a sponge or a towel. This bag will serve as a lid and weigh down those floating cucumbers. It’ll also prevent any pesky molds from sneaking in. And then you wait. This is the hard part of pickling. It’s best if your pickles are sitting in a room that stays between 65 and 80°F. The cooler it is, the slower the fermentation. Any warmer than this and you could end up with some slime. No one likes slime. First, you’ll see a few days of nothing. 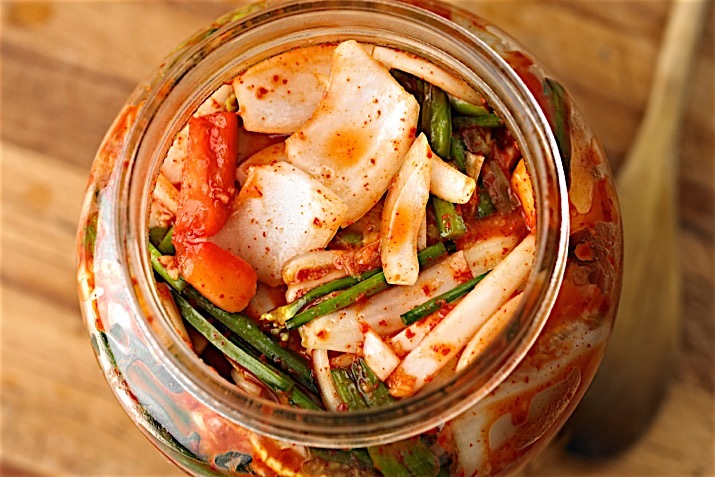 You’ll wonder if this whole fermenting thing is really going to work in your kitchen. Did you do something wrong? Are your bacteria not the right bacteria? It’s okay, the self-doubt will go after that first bite of pickle. Next, you’ll see a few days of cloudy brine and bubbles rising up and escaping from your jar. This is when I wonder why my dog is burping so much…and then I realize it’s my pickles. Last, after about 10-12 days total, you’ll stop seeing bubbles. The time for tasting has arrived! Go ahead. Be brave. Sampling your pickles is important because that’s how you know if they are ready. So after about 10 days, take off that bag of brine and pull out a cucumber, now a pickle. Give it a taste—if it doesn’t taste pickle-y enough for you, rinse off the bag o’ brine and put it back in place. Taste the pickles again in a day or two. If the pickles taste peppy and tart… VICTORY! You’ve made pickles! Fire up the grill for your favorite burgers and call your friends over to taste your kitchen experiment! One last tip: If you have any pickles left after your feast, just replace that bag of brine with a proper lid and store the pickles in your fridge. They won’t really go bad, but could lose their snappy texture after several months. Sandor Elix Katz is the fermenting guru of our day. Don’t believe me? People actually call him “Sandorkraut. That should tell you something. Check out his website and books for plenty more recipes and inspiration: www.wildfermentation.com.